Released in October 1982, the Mamiya ZM was the last Mamiya 35mm camera to be produced. 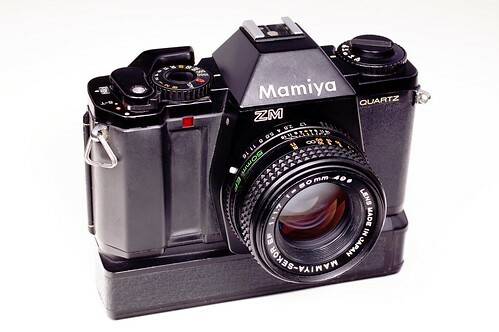 The ZM design was by Tsuneaki Munakata, who also designed the Mamiya RZ67 and Mamiya M645 Super. An advanced version of the ZE-2, with some of the features of the ZE-X, it has an aperture-priority automatic time control, based on center-weighted TTL readings. A metal electronically controlled automatic shutter-speed range from four (4) seconds to 1/1000 and a manual range from two (2) seconds to 1/1000 plus Bulb. It is powered by 2x 1.5v LR44/SR44 coin type batteries. Mamiya Z series, at Ron Herron's "Collecting Mamiya 35mm Cameras"
This page was last edited on 14 April 2017, at 07:47.